Phantoms coach Slava Koulikov addresses his players. 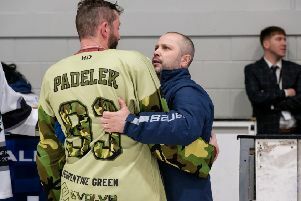 The city team were pipped 5-4 by Hull in a thrilling NIHL Final Four showpiece in Coventry (April 14) when missing out on another piece of silverware to complete a quadruple. Phantoms hoped to capture the overall play-offs crown to add to their NIHL Autumn Cup, NIHL South Cup and NIHL Division One South play-offs triumphs, but those dreams were dashed by an overtime strike from Pirates man Bobby Chamberlain. But Koulikov insisted his terrific team should forget the heartbreak of this loss and instead reflect on their achievements during a ‘brilliant journey’ that will live long in the memory. “It was the best teams from each conference going up against each other,” said Koulikov. “And in the end it came down to small margins. “Hull were fantastic. They created so many chances and I can only give them credit for their win, but we kept fighting and finding a response. “We were chasing the game for a long time and had to get back level on three occasions, but we obviously didn’t have the chance to do that again in overtime. “It’s only natural to feel disappointed after losing a play-off final, but there is no need for any negativity after a season of so many positives. “I’m proud of every single guy in our dressing room for playing their part in such an unbelievable year. I cannot praise them enough. “It’s been a brilliant journey from the moment we first stepped on the ice to the moment we stepped off it last night. “We have produced some amazing performances along the way and we have three trophies to show for it – all of which we were able to lift and celebrate on our home ice in front of our great fans. Phantoms will now turn their attention to building a roster capable of challenging for honours in the new NIHL Division One next season. They are expected to announce their first signings for 2019/20 at their end-of-season awards bash this Thursday (April 18).